At the opening of The University of Scranton’s Autism Collaborative Centers of Excellence Executive Hub are John W. Cosgrove, executive director of AllOne Foundation and Charities; John P. Moses, Esq., chair of the Board of AllOne Foundation; Debra Pellegrino, Ed.D., dean of The University of Scranton’s Panuska College of Professional Studies; and Rev. Scott R. Pilarz, S.J., president of The University of Scranton. The University of Scranton opened the Autism Collaborative Centers of Excellence Executive Hub on campus as part of a multi-year, multi-million regional initiative led by the AllOne Foundation intended to significantly enhance the service delivery system for individuals with Autism Spectrum Disorder (ASD) and their families living in 13 counties in Northeastern and North Central Pennsylvania. The initiative, announced by AllOne Foundation in September of 2018, formed five, family-friendly Autism Collaborative Centers of Excellence (ACCE) to deliver a full array of services and supports for individuals with ASD, from early intervention to adult services. “AllOne Foundation had a vision to develop a sustainable framework to address existing service gaps in care for those with ASD. Through the execution of this initiative and the research data we will be collecting, we are seeking to create a national model for scientifically-sound innovation for providing ASD care,” said John P. Moses, Esq., chair of the Board of AllOne Foundation, who also acknowledged the support of The Harry & Jeanette Weinberg Foundation, Margaret Briggs Foundation, Northeast PA Health Care Foundation, Highmark Foundation, Geisinger Foundation and Moses Taylor Foundation that made this initiative possible. With their support “AllOne was able to make the largest private philanthropic investment in a single health issue in Northeastern and North Central Pennsylvania,” said Atty. Moses. 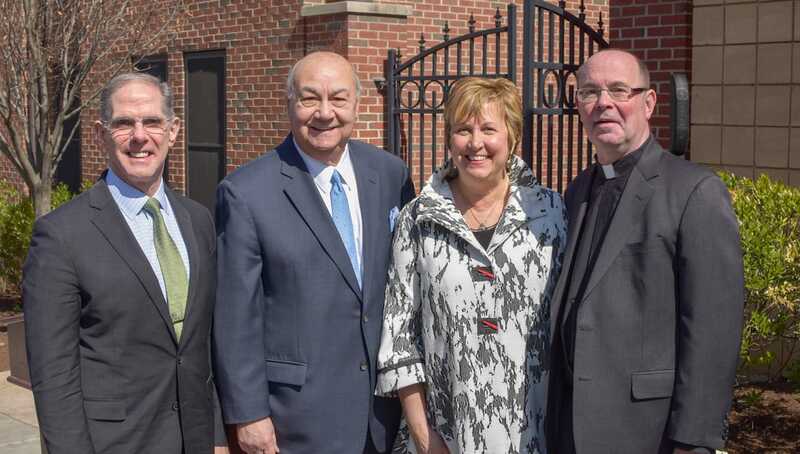 The University will serve as the executive hub of the five centers, which also include Misericordia University, Hope Enterprises (Williamsport), Children’s Service Center/Hazleton and Geisinger Autism and Developmental Medicine Institute (ADMI). The counties served by centers are: Bradford, Carbon, Clinton, Lackawanna, Luzerne, Lycoming, Monroe, Pike, Sullivan Susquehanna, Tioga, Wyoming and Wayne counties. In addition to providing a coordinated, comprehensive approach to the identification and treatment of ASD for children, adults, and families, The Autism Collaborative Centers of Excellence will: establish a coordinated network of qualified ASD providers to facilitate regional access to evidence-based care; ensure a consistent, seamless approach that allows for tracking service delivery transitions across multiple agencies; implement an ongoing process for data collection, analysis, and the reporting of outcomes and recommendations from the coordinated network of qualified ASD providers to enhance the delivery of evidence-based care; and enhance undergraduate and graduate training opportunities in ASD-related fields to create a highly skilled talent pool for the region, among other goals. “For the initiative to be sustained, it is imperative we develop a highly-trained workforce to provide the best services available to individuals with ASD and their families in our region, said Debra Pellegrino, Ed.D., dean of the University’s Panuska College of Professional Studies. Beginning in the fall 2019, the University will offer an 18-credit Applied Behavior Analysis Certificate of Advanced Graduate Study for professionals working in psychology, education, child care, speech and language disorders, and counseling and human services. At the opening, University faculty discussed aspects of the Verbal Behavior Milestones Assessment and Placement Program (VB-MAPP) in the center’s state-of-the-art assessment labs that will be taught as part of this post-graduate program, which will be housed in the University’s Department of Counseling and Human Services. Each lad is also equipped with recording devices to aide in education and training of the students and assessment purposes. Currently, applications are being accepted for the program. “Based on research of the combined county census data and a presumed ASD prevalence of 1 in 68, the estimated number of individuals in the region living with ASD is more than 17,500. This is a high-impact initiative,” said Dean Pellegrino. For more information about the Autism Collaborative Centers of Excellence, visit the Center’s website or call 570-941-7000.